Gilberte Interiors, Inc. Aharon Boghosian - Gilberte Interiors, Inc.
Aharon has more than 40 years experience in the industry. A graduate of UNH Whittemore School of Business, Aharon started his career at the ground level of Gilberte’s. He continued his development and broadened his experience in the field with several years in sales and marketing for a national window coverings manufacturer. Aharon rejoined the family business in 1989. He is involved in all aspects of the business. 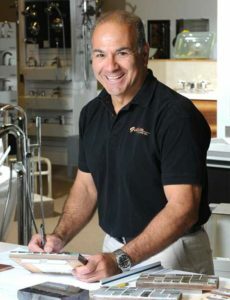 His forte is within the bath, kitchen, tile, stone, and window treatment areas of the business. Aharon’s eye for detail, personal customer service, and devotion to the business are evident the moment one steps into the showroom.